Indian cricketer Ankit Keshri has died after colliding with a team-mate as they both attempted to take a catch in a club match in Kolkata on Friday. The 20-year-old, a former captain of Bengal's under-19 state team, was only on the field as a substitute fielder. He reportedly regained consciousness after the collision, but later suffered a cardiac arrest in hospital and died on Monday. Former India batsman Sachin Tendulkar said he was "saddened" by the news. "A promising career aborted by an unfortunate incident on field," Tendulkar, who has scored more Test and one-day international runs than any other player, tweeted. 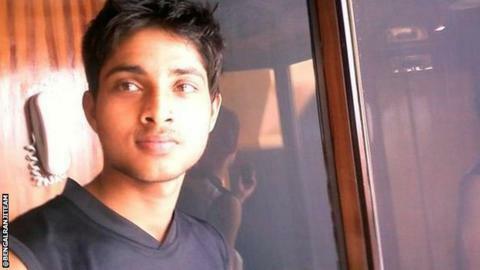 "May God give strength to Ankit's family and friends to cope with this loss." Manoj Tiwary, who has played nine one-day internationals for India, predicted on the social media site that Keshri would have represented his state at senior, as well as age-grade, level. Australia Test batsman Phillip Hughes died in November after being struck by a delivery bowled in a domestic match in his home country.